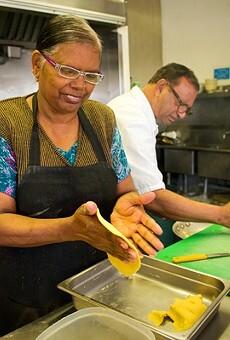 Chris Duffey Rooplal and Sushil Masih make many of their dishes from scratch while you wait. Hours: Thu.-Tue. 11 a.m.-7:30 p.m.
A while back I stumbled upon a few Chowhound discussion threads that raised some version of the question, "What's good to eat near the Oakland airport and/or the Coliseum that isn't In-N-Out?" The answer, inevitably: "Nothing. Except this one Indian place ...."
That one Indian place, Masala Cuisine, is housed in a tiny concrete shoebox located on a wide, barren stretch of International Boulevard. Sandwiched between two storefront churches, the restaurant doesn't look like much: red graffiti on the facade, a takeout window covered in bulletproof glass. 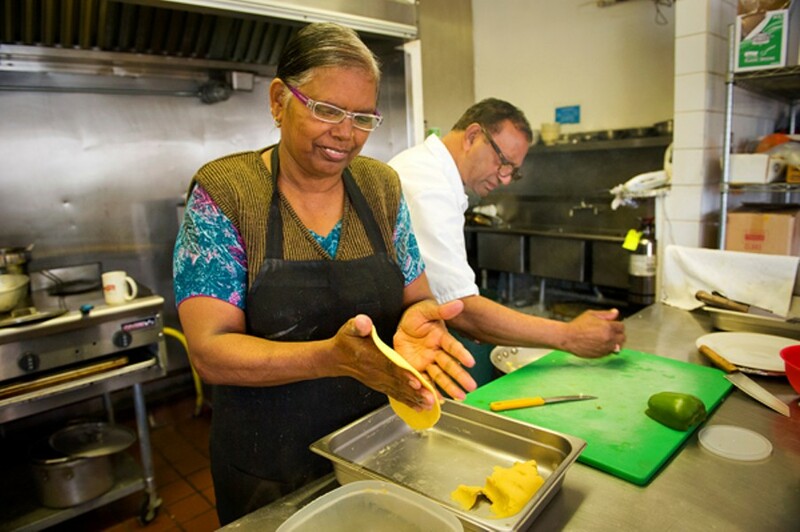 Rooplal and Sushil Masih, the husband-and-wife owners, keep the front door locked. But don't let the humble environs deceive: You'd hard-pressed to find better-tasting Indian food, served with as much warmth and enthusiasm, anywhere in the city. If you come, as we did, on a day when Sushil is working by herself, she'll offer you a seat inside and maybe also a sheepish apology for her English, which is tentative and laughter-punctuated, reminding me so much of my own immigrant mother's way of speaking that I felt right at home. And that's what Masala Cuisine is, really: the closest thing I've experienced, in a restaurant setting, to being invited into the home of two wonderful Indian cooks. Here, fancypants concepts like "open kitchen" and "chef's table" are given new meaning. You eat at a plastic-tableclothed folding table right on the edge of the kitchen, and your entire meal is cooked on an oven range no bigger than the one you have at home. Many of the dishes are literally made from scratch while you wait — only after taking your order does the chef chop the onions. During that first visit, we ordered an off-menu weekend special: makki di roti (a kind of corn flour flatbread) and sarson ka saag (a purée of mustard greens and spinach) — a traditional pairing in Punjab, the Masihs' home state. Potent, excellent hot chai was brewed to order in a small pot, then poured into paper cups. Five minutes later, Sushil brought over an order of pakora (vegetable fritters) and asked if we'd like to try them. The battered, lightly spiced chunks of eggplant, potato, and onion were more home-style than restaurant-style — flavorful and not very greasy, if not so crispy. The soundtrack, while we sipped tea and munched on pakora, was the slap slap slap of Sushil working at a ball of dough, then forming each yellow makki di roti by hand. Once griddled, the rotis were like thick corn tortillas — toasty, well blistered, and delicious. But the real revelation was the sarson ka saag. If you've eaten at Indian restaurants even a few times, you've almost certainly had saag, the creamy spinach purée. Masala Cuisine's version — with the deep earthiness of the mustard greens and a hit of fresh ginger that made the whole dish sing — was better than the usual by several orders of magnitude. We broke off pieces of roti and used them to scoop up the saag, and when the bread was gone, we savored the rest over basmati rice. But, lest anyone mistake this for Fremont or some de facto Little India, there's also a section of the menu devoted to fried chicken and catfish — a concession to Deep East Oakland, and a reminder of just how out of place the restaurant really seems. So how did the most authentic home-style Indian restaurant in town end up in this neighborhood? Rooplal Masih explained that about three years ago he was laid off from the tech job that he'd held for more than a decade. To make ends meet, he fell back on the cooking skills he honed (and later taught his wife) during his fifteen years as a chef in the Indian Navy. The rent in East Oakland was affordable, and there wasn't much competition. According to Rooplal, there's one other Indian restaurant in the general vicinity of Fruitvale, and none at all in nearby San Leandro. 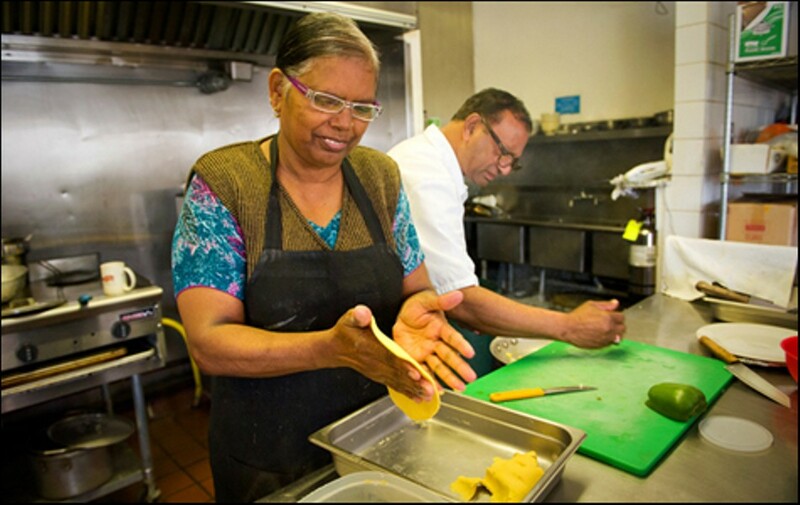 Still, because of its location, Masala Cuisine doesn't get many Indian customers, and that's a shame — a shame, really, that anyone in the East Bay who loves Indian food would miss out on this gem. During my two lunches (the second of which was presided over by both husband and wife), dish after dish was characterized by uncommon freshness and depth of flavor, and the various sauces, in particular, benefited from being cooked to order. The butter chicken, that curry house staple, was unlike any other I've had — the bright-red sauce buttery indeed and barely sweet, built on a fragrant base of garlic, onions, and dried fenugreek leaves; the boneless thigh meat was toothsome and generously portioned. The vegetarian malai kofta were vegetable "dumplings" served in a creamy sauce thickened with cashew paste, which added a subtle sweetness — very complex, very delicious. The only entrée that didn't hit it out of the park was the rogan josh, a traditional lamb stew: While the sauce was rich and had plenty of meaty flavor, the lamb wasn't cooked long enough (despite the use of a pressure cooker) to be truly tender. Whatever you order, the gobi paratha, stuffed with cumin-spiced cauliflower, is good for sopping up all of that saucy goodness. Be forewarned that a meal at Masala Cuisine takes time, at least an hour for a sit-down lunch (a note on the menu asks takeout customers to place orders an hour in advance). Look, home cooking takes time: time for the just-chopped ginger and garlic to sizzle in the pan. Time for Rooplal or Sushil to come over to your table between each course so you can taste a small sample each dish, to make sure the spice level is exactly how you want it. Trust me, it's worth the wait.